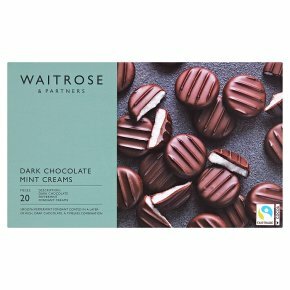 INGREDIENTS: Sugar, dark chocolate (36%) (cocoa mass, sugar, cocoa butter, emulsifier (soya lecithin)), glucose-fructose syrup, water, peppermint oil, stabiliser (invertase). For allergens see ingredients in bold. May contain: peanuts, milk,nuts.